While Runtime Broker is a legitimate Windows process, it has acquired the reputation of causing high RAM and CPU Usage on Windows computers. 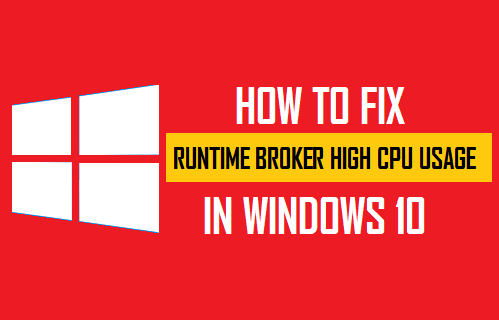 You will find below the steps to fix the issue of High CPU Usage by Runtime Broker in Windows 10. Runtime Broker (RuntimeBroker.exe) is an executable file located in the System32 folder on your computer. The main task of Runtime Broker is to make sure that applications running on your computer have the required permissions to run on your system. Hence, Runtime Broker can also be described as security broker or middleman between applications and the hardware on your computer. Users affected by Runtime Broker High RAM and CPU Usage have reported noticing as much as 5o% CPU and 1 GB RAM being used by Runtime Broker on their computers. Going by Microsoft’s website, RuntimeBroker should only use a few megabytes of memory. Microsoft recommends terminating the Runtime Broker Process, in case it is using more than 15% of memory on your computer. However, terminating the Runtime Broker Process helps only in case the Runtime Broker is bothering you once in a while. If the problem keeps appearing, you can use other methods as provided below, to fix permanently fix the problem of High CPU Usage by Runtime Broker on your computer. 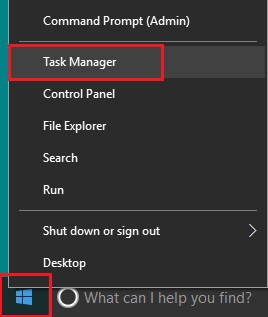 To stop or kill Runtime Broker Process, right-click on the Start button and click on Task Manager in the menu that appears. Note: You can also use Ctrl-Shift-Esc shortcut to open the Task Manager. On the Task Manger screen, right-click on Runtime Broker located in “Process” tab and then click on End Task in the contextual menu that appears. 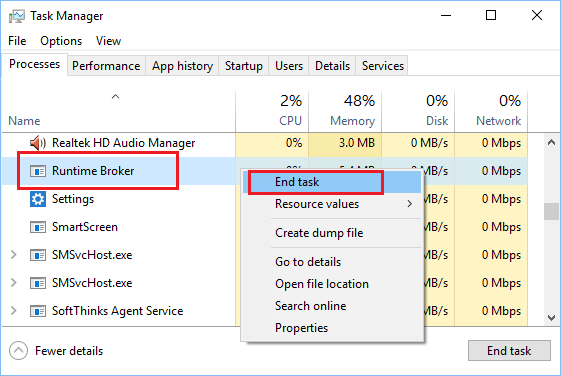 As mentioned above, killing Runtime Broker in the Task Manager screen is a temporary solution. Runtime Broker will once again launch itself when you restart your computer and start using Windows Apps. According to Microsoft, Runtime Broker is likely to cause high CPU and RAM usage on Windows computers, in case it comes across any faulty app on your computer. Hence, the next step would be to figure out, if any application in particular is triggering high CPU usage on your computer. You can Uninstall the App, in case the App in question is not an essential App. If the app is important to you, make sure that you update the App to its latest version. 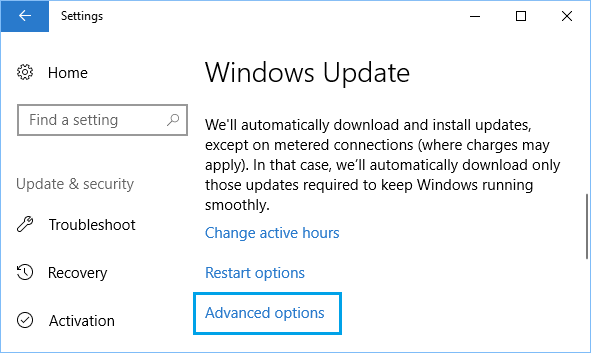 If no updates are available, Uninstall the App, Restart your PC and Install the App back again on your computer. Windows operating system has a feature that brings tips and tricks from Microsoft as you continue using your computer. However, this feature has been linked to High CPU usage and other problem on Windows computers. To Disable “Get Tips & Tricks”, click on the Start button > Settings icon. On the Settings screen, click on System. Many users have reported significant reduction in Runtime Broker activity after making this single change on their Windows computers. 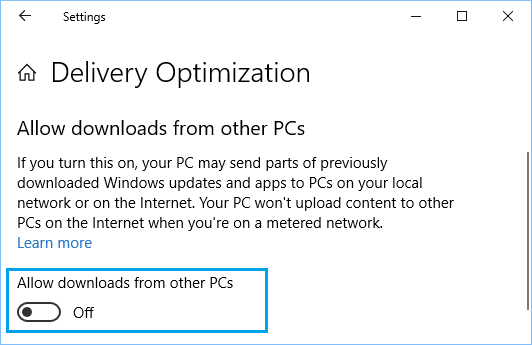 Microsoft wants to make use of other PC’s on your Network and also other PC’s on the internet to deliver quicker updates to your computer. Disabling this option has helped many users to reduce the activity of Runtime Broker on their computers. Click on Start button > Settings icon and on the Settings screen, click on Update & Security. On the Update & Security Screen, click on Advanced Options. On the next screen, disable the option for Allow Downloads from other PCs by moving the toggle to OFF position. Allowing unnecessary Apps to run in the background on your computer leads to waste of resources, as you may not even by using many of these Apps. Click on the Start button > Settings Icon. On the Settings screen, click on Privacy. On the Privacy Settings screen, click on Background Apps in the side-menu and disable all unnecessary Apps from running in the background on your computer by moving the toggle to OFF position. 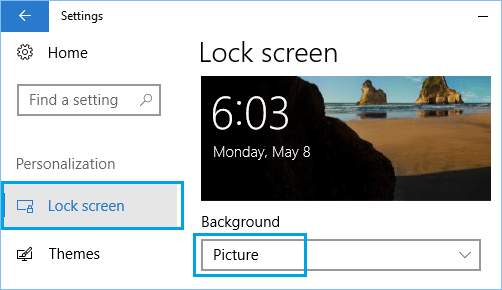 Switching Lock screen Background type to Picture is another solution for the issue of High CPU usage by RunTime Broker in Windows 10. Click on the Start button > Settings Icon. On the Settings screen, click on Personalization. On the next screen, click on Lock Screen in the side-menu and set the background type to Picture. By default, the OneDrive App starts automatically on your computer and remains active in the background. In case you are not using OneDrive, it makes much sense to either disable or Uninstall OneDrive App from your computer. 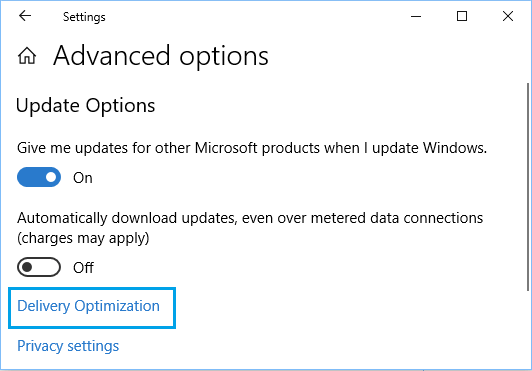 You can take a look at How to Disable or Uninstall OneDrive in Windows 10 to learn more about this.